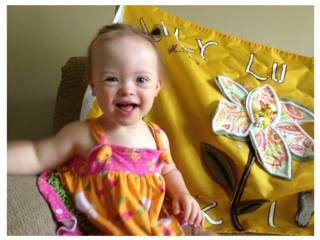 As many of you know, Lily’s Buddy Walk team is called the “Lily Lu Whos” – ever wonder why? When Lily was still in my tummy we called her Lulu. We knew her middle name would be Luet but waited until we met her to give her, her first name. Now I, like many of my previous co-workers always came up with nick names for the animals we worked with at the zoo (oh yeah, I was a zoo keeper in another life). I was especially bad- I even named quite a few animals and still gave them ridiculous nick names! So it was to be expected that I would continue the tradition with my daughter. My husband was the first to coin the name Lulu but once she was born and named Lily- my primal need to nick name took over. It started with Lily Lu and as I got to know this little spirit, I began to understand that she was unlike any other child I had ever known- she exuded joy and innocence and silliness. So then I began to call her a little Who like the Dr Seuss Whos. And…..wait for it….yep, then came Lily Lu Who. Although she has had several affectionate nick names from her crazy mama, this one really stuck when I was finally able to put her hair in a pony tail (top knot style). Oh yeah, her outer Who was beginning to match her inner Who. 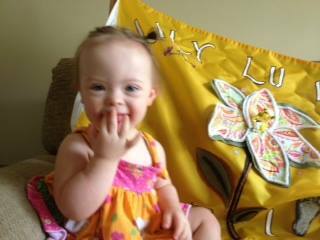 Hence when the time came to choose a team name for her- The Lily Lu Whos was the only reasonable choice! We look forward to dressing up as Whos in her future buddy walks.